Back when we launched our Bring A Cup campaign last year, we offered cup-buyers the chance to add a few pounds on to the cost of the cup, to go towards tree-planting. Thanks to these additional donations, we were able to plant the ‘Shambala Copse’ – 165 native trees that are going to help reforest our countryside. 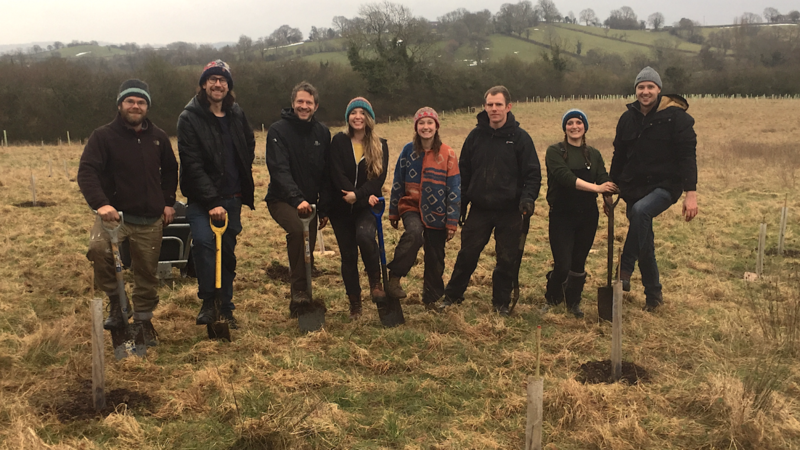 Big up the tree planting crew of Dan, Chris, Becka, Lucy, Damien, Graham, Tom and Abi who helped make it happen, in typically British weather conditions! The State of Nature report in 2016 revealed over half of Britain’s wildlife species are in decline, and even though the UK has lost so much forest cover, we still have one of the lowest levels of reforestation in Europe. Planting trees is essential if we are to support wildlife, rewild our countryside and combat climate change. The site is a southern facing slope in the beautiful Chew Valley just 10 miles south of Shambala HQ in Bristol. Arching the top corner of the field on this grassy patch of land, with views of the Mendips in the distance, the copse has been designed to have a small clearing in the middle of a tightly knit wood. When it came to planting time, the ‘Beast from the East’s ice and snow had thankfully melted, and the ground was delightfully squishy, enabling us to make fairly quick work of it. Making up the Shambala Copse is a range of Aspen, Alder, Rowan, Silver Birch, Downy Birch, Common Crab Apple, Wild Cherry, Hornbeam, Beech and Bird Cherry. Each tree was supported with a bamboo cane and plastic guard to protect them from smaller animals as they establish themselves, and finished with a layer of mulch to keep the grass at bay and provide nutrients for the growing tree roots. As we planted we dedicated trees to loved and lost crew members and memories made at Shambala. As a living breathing representation of the acts of kindness practised by Shambalans, it is hoped we will return over the next few years to look after, cherish and enjoy this special spot. A heartfelt thank you to all who donated towards this initiative.